Ruiz-Maldonado et al established criteria for hypomelanosis of Ito that include nervous system or musculoskeletal anomalies  ; however, the strength of these associations has been questioned in other studies. Currently, hypomelanosis of Ito is considered an umbrella term. Some cases may present with isolated cutaneous findings, while a portion have associated systemic anomalies, most commonly of the nervous system. Larger studies are required to provide further evidence to support possible associations with different anomalies. 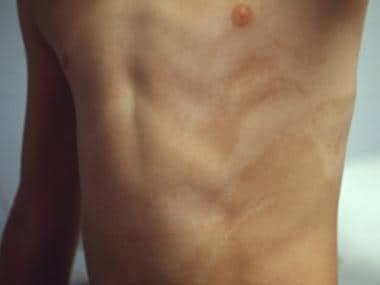 Hypomelanosis of Ito on the torso. Extracutaneous manifestations might be due to the presence of different genetic defects. Chromosomal mosaicism and sporadic mutations are the causes of hypomelanosis of Ito. No clear racial predilection has been reported for hypomelanosis of Ito. Hypomelanosis of Ito is present at birth, and patients usually undergo examination in their first or second year of life. Approximately 75% of patients with hypomelanosis of Ito seek care by the time they are aged 2 years. One fourth of patients seek care between ages 2 and 5 years. Skin lesions may become more pigmented over time and blend well with normally pigmented skin. The prognosis is determined by any associated abnormalities. The prognosis is excellent for the cutaneous findings. Death is rare. Morbidity depends on severity of the associated abnormalities, such as seizures. Genetic counseling may be recommended. However, the risk of hypomelanosis of Ito transmission is considered low, except when X-linked mutations are present in female patients. Ruiz-Maldonado R, Toussaint S, Tamayo L, Laterza A, del Castillo V. Hypomelanosis of Ito: diagnostic criteria and report of 41 cases. Pediatr Dermatol. 1992 Mar. 9 (1):1-10. [Medline]. Cohen J 3rd, Shahrokh K, Cohen B. Analysis of 36 cases of Blaschkoid dyspigmentation: reading between the lines of Blaschko. Pediatr Dermatol. 2014 Jul-Aug. 31 (4):471-6. [Medline]. Pavone V, Signorelli SS, Praticò AD, Corsello G, Savasta S, Falsaperla R, et al. Total Hemi-overgrowth in Pigmentary Mosaicism of the (Hypomelanosis of) Ito Type: Eight Case Reports. Medicine (Baltimore). 2016 Mar. 95 (10):e2705. [Medline]. Molho-Pessach V, Schaffer JV. Blaschko lines and other patterns of cutaneous mosaicism. Clin Dermatol. 2011 Mar-Apr. 29:205-225. [Medline]. Ponti G, Pellacani G, Tomasi A, Percesepe A, Guarneri C, Guerra A, et al. Hypomelanosis of Ito with a trisomy 2 mosaicism: a case report. J Med Case Rep. 2014 Oct. 9:333. [Medline]. Girard C, Guillot B, Rivier F, Dalla Vale F, Bessis D. Trisomy 20 mosaicism revealed by pigmentary mosaicism of the Ito-type. Ann Dermatol Venereol. 2005 Feb. 132:151-3. [Medline]. Ruggieri M, Pavone L. Hypomelanosis of Ito: clinical syndrome or just phenotype?. J Child Neurol. 2000 Oct. 15 (10):635-44. [Medline]. Ream M. Hypomelanosis of Ito. Handb Clin Neurol. 2015. 132:281-9. [Medline]. Assogba K, Ferlazzo E, Striano P, Calarese T, Villeneuve N, Ivanov I, et al. Heterogeneous seizure manifestations in Hypomelanosis of Ito: report of four new cases and review of the literature. Neurol Sci. 2010 Feb. 31(1):9-16. [Medline]. Scott A, Micallef C, Hale SL, Watts P. Cortical visual impairment in hypomelanosis of Ito. J Pediatr Ophthalmol Strabismus. 2008 Jul-Aug. 45(4):240-1. [Medline]. Iype M, Iype T, Geetha S, Retnakumar J. Hypomelanosis of Ito with cerebral malformation. Indian J Pediatr. 2007 Nov. 74(11):1044-5. [Medline]. Vergine G, Mencarelli F, Diomedi-Camassei F, et al. Glomerulocystic kidney disease in hypomelanosis of Ito. Pediatr Nephrol. 2008 Jul. 23(7):1183-7. [Medline]. Calonje E, Brenn T, Lazar AJ, McKee PH. Disorders of Pigmentation. Elsevier/Saunders. McKee's Pathology of the Skin: With Clinical Correlations. 4th ed. Philadelphia, Pa: Elsevier Saunders; 2011. 912. Devillers C, Quatresooz P, Hermanns-Lê T, Szepetiuk G, Lemaire R, Piérard-Franchimont C, et al. Hypomelanosis of Ito: pigmentary mosaicism with immature melanosome in keratinocytes. Int J Dermatol. 2011 Oct. 50 (10):1234-9. [Medline]. Hypomelanosis of Ito on the arm. Hypomelanosis of Ito highlighted with a Wood lamp.